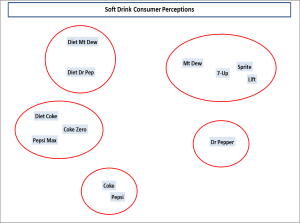 The first step in interpreting an overall similarities (OS) perceptual map is to understand how the data is constructed. 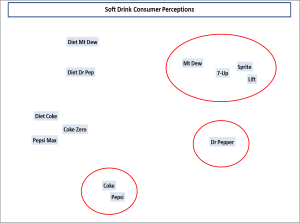 Instead of asking consumers to rate brands on an individual product attribute basis, consumers compare PAIRS of brands and rate how similar or different they are in their minds (that is, their perception). As you can see on the left, the brands (e.g. Coke and Pepsi) are paired together and consumers will need to compare them using the comparison scale (in this case a 1 to 9 scale is being used). For Coke versus Pepsi, the respondent scored the comparison between these tow brands as a 1.0 – meaning that the respondent perceives these two brands as “virtually” the same. This brand pairing process then continues in sets – next it is Coke versus Sprite, then Coke versus Diet Coke as so on. It is always important to remember that we are measuring the consumer’s perceptions rather than a technical reality between the brands. The next step used to physically produce the overall similarity perceptual map. Fortunately this website provides a free download of an Excel template that will allow you to do this relatively easily. Depending upon your market, competing brands, and source of data, your map may look a little bit different to the one on the left, the conceptually it should be quite similar. What you should have is the brands scattered around the map with some underlying logic, which should be based upon your knowledge of that market. Step Three – Identify the competitive sets. 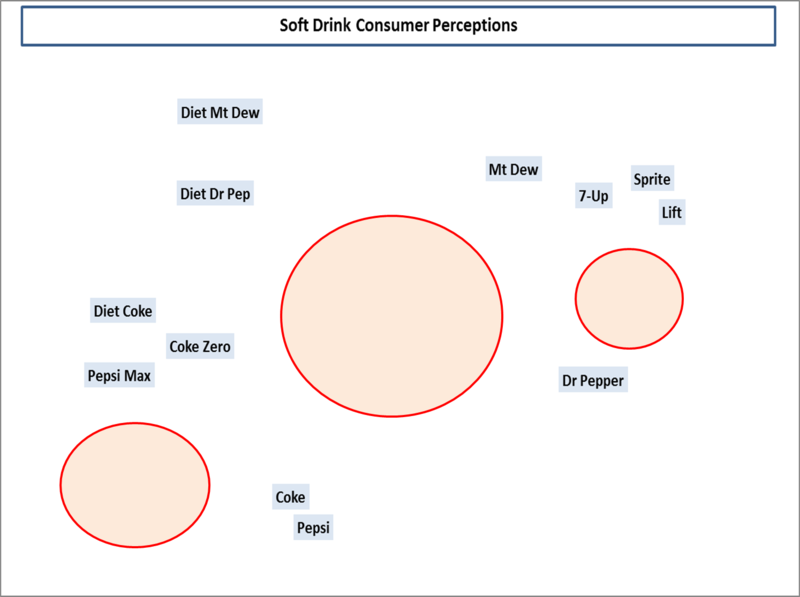 As you can see on the left, this perceptual map has five sets of competitors identified. This is on the basis of the natural clustering of the brands that have occurred on the map. Therefore, this is an ideal approach to identify how consumers see direct and indirect competitors in the marketplace. 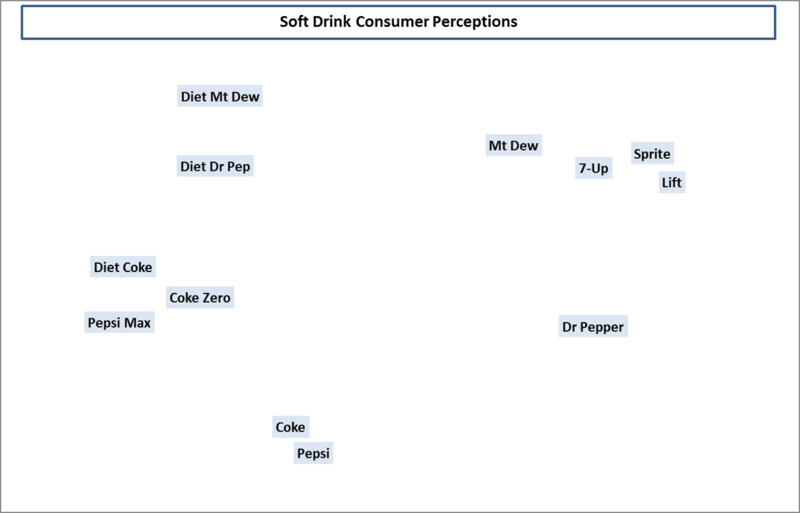 In a busy perceptual map, where there are lots of brands listed, this might not be as obvious. Also different target markets may have a slightly different view of the competitive sets. Fortunately it is possible to run this map on a market segment basis (if the data is available). You should note, by viewing the three competitive sets highlighted on the left, that there are different numbers of competitors in each group. 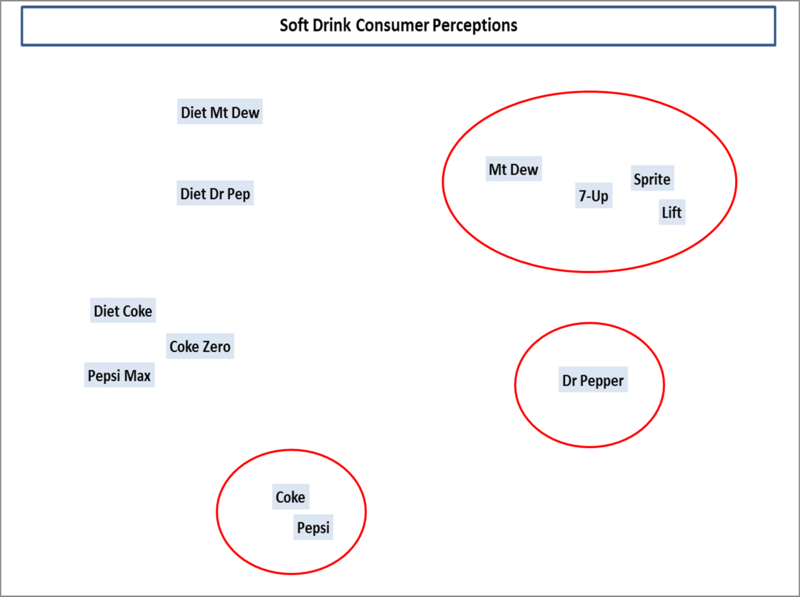 In this example, Dr Pepper is in a competitive set by itself. This means that on this view of the market it has a highly differentiated market position. 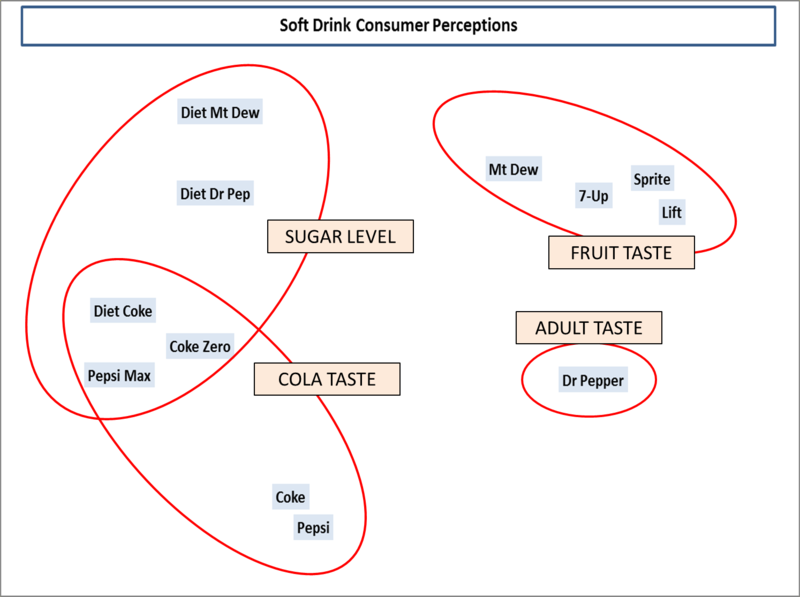 Compare this to the four brands in the top circle, where they have far less unique differentiation and are perceived relatively similar to each other by the consumers in the market. 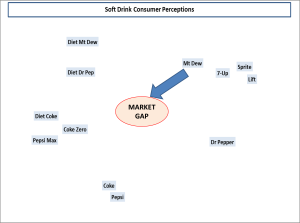 One of the key uses of the perceptual map is to identify gaps, or opportunities, in the marketplace. In this particular example, there are three possible gaps that have been identified, where no brand is perceived to be positioned. 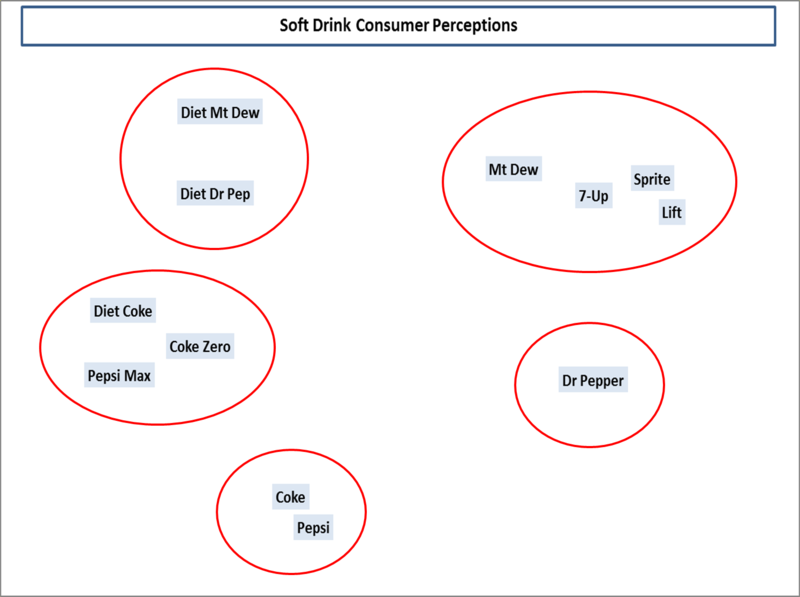 As an example, the Pepsi Next product which was released in 2012 would probably sit in the circle between Coke and Pepsi Max. 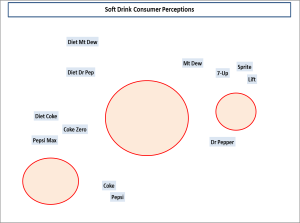 If this type of perceptual map is produced on a regular basis, say yearly, it would be possible to identify how the brands have shifted, or have been repositioned, over that time. The final step, which is probably the most challenging, is to work out HOW the consumers differentiate between the brands in the market. This is the opportunity for the firm to think differently about the market. 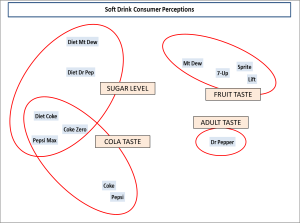 In this straightforward example, the likely product attributes of tastes, flavors and sugar levels have been identified on the perceptual map.